Sometimes we read books because we feel like we should. That is the situation with John Steinbeck and me. He appears on lists of books you must read if you are a well-read person. I like to consider myself a well-read person. The obvious conclusion is that I must read Steinbeck. He doesn't fit into my usual reading habits. My classics of choice are usually by such authors as Jane Austen or Anthony Trollope. Steinbeck is bigger and grittier and...more American. How did I get on with him? I am not really sure. I am not going to summarize the book, you can find a summary online if you want one, this is simply my impressions of it. I read the first few pages and I fell in love with some of Steinbeck's descriptions. Every petal of blue lupin is edged with white, so that of field of lupins is more blue than you can imagine. And mixed with these were splashes of California poppies. These too are of a burning color--not orange, not gold, but if pure gold were liquid and could raise cream, that golden cream might be like the color of the poppies. When their season was over the yellow mustard came up and grew to a great height. When my grandfather came into the valley the mustard was so tall that a man on horseback showed only his head above the yellow flowers. On the uplands the grass would be strewn with buttercups, with hen-and-chickens, with black-centered yellow violets. And a little later in the season there would be red and yellow stands of Indian paintbrush. These were the flowers of the open places exposed to the sun. Under the live oaks, shaded and dusky, the maidenhair flourished and gave a good smell, and under the mossy banks of the water courses whole clumps of five-fingered ferns and goldy-backs hung down. Then there were harebells, tiny lanterns, cream white and almost sinful looking, and these were so rare and magical that a child, finding one, felt singled out and special all day long. Steinbeck's descriptions of people could be just as enthralling. In this excerpt he is describing Liza Hamilton and really, this tells you all you need to know about her. And she looked forward to Heaven as a place where clothes did not get dirty and where food did not have to be cooked and dishes washed. Privately there were some things in Heaven of which she did not quite approve. There was too much singing, and she didn't see how even the Elect could survive for very long the celestial laziness which was promised. She would find something to do in Heaven. There must be something to take up one's time--some clouds to darn, some weary wings to rub with liniment. Maybe the collars of the robes needed turning now and then, and when you come right down to it, she couldn't believe that even in Heaven there would not be cobwebs in some corner to be knocked down with a cloth-covered broom. If Steinbeck had used his beautiful descriptions and way with words simply to tell the story of the Hamiltons and the Trasks I think I would have loved this book. My issues with it are the same things that many feel are the things that make it great. The novel has huge messages of depravity, redemption, free will, and evil versus good. There is a biblical parallel throughout the book with the story of Cain and Abel. It is not the biblical parallel I had a problem with, I am a religious person myself, it is that these parallels and lessons were driven home with such a heavy hand. I like my points made quietly, lightly, not with a sledgehammer. Leave the reader to come to conclusions on his own, let him spend time musing and thinking about the book and what the author is trying to say. Don't beat the message into him. There was one character who was so unpleasant that she didn't seem to fit into the book. Steinbeck himself described her as a monster. Again, I understand the whole good versus evil, but this character was so evil that whenever she came into the book she completely pulled me out of the story. She wasn't real to me and I didn't want her to be. 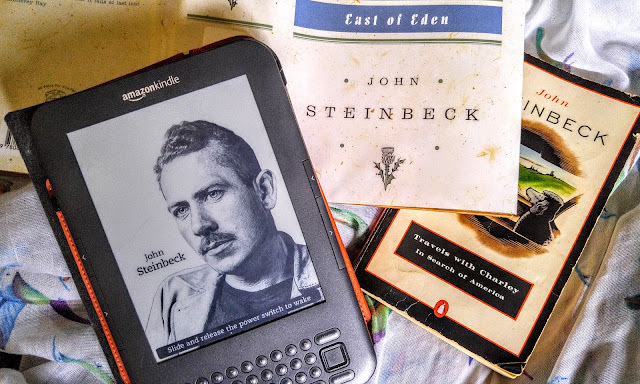 So we come back to the question: how did I get on with John Steinbeck? The answer is I just don't know. The book is very readable and there were parts when I didn't want to put it down. But then there were parts when I hated it. I loved some of his writing but I hated some of his characters. In a way, I felt as if it was two books. One was the story of two families and their intertwined lives and one was an allegory that was so involved in itself that it sometimes lost the story. I loved one but not the other. Would I read Steinbeck again? Yes, I think I would. For those moments when he says the things I wish I could say, those moments when I find myself rereading a description because it is just so right. "I like my points made quietly, lightly, not with a sledgehammer. Leave the reader to come to conclusions on his own, let him spend time musing and thinking about the book and what the author is trying to say. Don't beat the message into him." I feel the same as you on this point. It is one of the reasons why some popular Victorian social literature and I don't get along so much. I have East of Eden on my Classics Club list, too, though, and I was already a little intimidated by it but now I'm looking forward to it even less... except that the passages you quoted really are lovely, so maybe all is not lost! I ended up with such mixed feelings about it. The language was beautiful at times and some of his descriptions were wonderful but I just couldn't like many of the characters. I will be interested to hear what you think of it. There's a miniseries of this book with the evil woman played by Jane Seymour. It's piping good... I prefer it to the James Dean adaptation. I didn't know that. I will have to check it out. I feel the same about Steinbeck. We had to read Of Mice and Men in high school, and I also read Cannery Row. Both of them were wonderful and moving. However, I tried to read Grapes of Wrath and hated it. It's one of the only books I haven't finished. I haven't tried to read Steinbeck since, though your post has reminded me that I've been meaning to try East of Eden. Maybe one of these days I will try Of Mice and Men. I have heard several people say that they hated Grapes of Wrath so I am not in a hurry to read that. I'm one of the few people I know who have read this book who didn't like it. I thought his drawing of good and evil in people made them into caricatures. So this is not the Steinbeck I would have advised to start with. Perhaps Of Mice & Men or The Red Pony? Yes! That is it exactly. They are caricatures. I couldn't believe in them since they were so exaggerated. I did love his descriptions though. You are the second to recommend Of Mice and Men so maybe that is what I should read if I decide to take on any more Steinbeck. East of Eden is on my Classics Club list too, and as I'm coming to the end of my list I'll probably be reading it soon. I haven't really been looking forward to it (I've only read one of Steinbeck's books - The Pearl - and wasn't impressed) so I'll be curious to see what I think. I will be curious to see what you think too. I actually think the more time that goes by the less I like it. Some of the language is beautiful so that pulled me in but now I am left with the story and that just isn't doing it for me. I don't get along with Steinbeck either. He seems to delight in putting characters in impossible situations, where they can only make wrong choices, and then sitting back and saying, "Don't judge them, how could they make any other choice?" Dude, you created this artificial situation, you orchestrated this decision -- this is on you, the author, not on them. Yes, exactly. The thing is, I kept feeling that buried under the misery and characters I didn't like was a book I could have really enjoyed. He just didn't write that book. It's just as well we're all different! I really enjoyed the book although it isn't my favourite of his - and I'm not at all religious. If you haven't already done so you might enjoy reading his Travels with Charley. I actually read Travels with Charley last month and basically enjoyed it which is what made me pick up East of Eden. Variety in books and opinions is what adds spice to life. Oh no! I have an unread copy of East of Eden and I had been very convinced I will adore it as much as Of Mice and Men (still my favorite read of 2016). That expectation is now slightly rattled as I do think you and I share similar literary tastes. The descriptive passages you quoted are indeed lovely. Not to mention, oddly absent from Of Mice and Men. Like you, however, I dislike heavy-handed aesops. I suppose I’ll see for myself when I get around to reading East of Eden since it’s also on my Classics Club list. I agree that we seem to share literary tastes so maybe I should give Of Mice and Men a try. I think heavy-handed is the perfect description of East of Eden. I like my stories and my morals with a lighter touch. I will be curious to see what you think of it.